You’re seventy-five years old. You’ve lived a good, ordinary life, filled with the all the trappings that an ordinary life should entail. You’ve said goodbye to your spouse and to your career and your children have gone on to create lives of their own. You’ve done all you can be expected to do. However…you can now begin again–for a price. In exchange for a two-to-ten year stint in the armed services, during wartime, you can be restored to your youthful glory, nay a youth even more glorious. If you survive, you can begin a new life on a colony far from home and live a new life, filled with all the trappings that such an extraordinary life should entail. This is the central premise of John Scalzi’s Hugo-nominated novel, Old Man’s War. John Perry, a former advertising writer from Ohio, is ready to begin again. He and his wife, Kathy, had both signed up to enlist in the Colonial Defense Forces (CDF), but Kathy dies before she can enlist at age seventy-five. The CDF purportedly only recruits seniors in an effort to take advantage of their extensive life experience and can presumably restore youth to the bodies of their enlistees. It seems the galaxy is full of alien races with which humans compete for livable real estate and the casualty rate for CDF infantry is fairly high. Nevertheless, those that survive will be given the opportunity to live on one of the many far-flung colonies that the CDF works so hard to protect. Perry, essentially done with life on Earth, decides to follow through on his pledge; it is his advancement through the ranks of the CDF that forms the structure of the novel. Old Man’s War is often compared to Robert Heinlein‘s Starship Troopers, and for good reason. Both are military adventure stories that follow the life of a recruit in the armed forces, defending human colonists from genocidal destruction at the hands of alien races. However, each novel’s overall tone could not be more different. Heinlein used his tale to pontificate on the needs of a strong military and a strong state to fight the hive-mindedness of the commun…I mean, the insectoid aliens. Scalzi’s tone is often just this side of tongue-in-cheek. It is first and foremost an adventure story told with a wink and nod, though it does contain some effective scenes that invoke the appropriate sense of pathos–death is a large theme of the book after all. 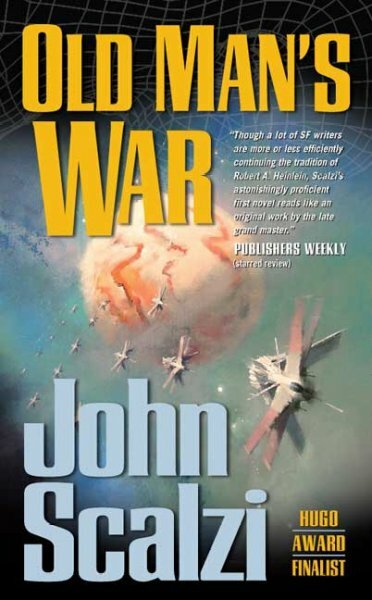 The novel is essentially “Heinlein-meets-M*A*S*H*” in that Scalzi largely invokes the absurdities of war as well as the nobility of many of its participants. Great comedic scenes are brought in stark relief against the dramatic heroics of the CDF. Old Man’s War is tight and light, funny and fast. It’s a satisfying read that invokes a lot of the fun of golden age adventure while maintaining a more modern sense of humor and outlook. Highly recommended. This entry was posted in Reviews and tagged fiction, john scalzi, novel, review, sci-fi. Bookmark the permalink.